Pets make almost everything better! Trips to the beach, hikes in the park, and barbeques in the backyard. Everything is better, except when it comes to selling a house with pets in Maryland. When preparing your home for showings, the goal is to keep the buyer focused on all the great things it has to offer. A plethora of dog toys, stinky cat litter boxes, and animal cages are all distractions for the buyer. Remember, we want the buyers to recall your house as the home with the great deck, not the cat house that smelled like litter. Let’s jump into the tips and tricks we’ve learned over the years. Selling your home fast is all about first impressions. When you initially list your home you will have a large influx of showings, representing most of the current buyer pool in your price-range. It is important that this first weekend of showings goes off without a hitch to give you the best shot at a quick contract. With showings scattered all throughout the day, it can be difficult to juggle the pets while keeping your home pristine for each set of buyers. Cleaning up new pet hair and putting away all the pet toys is a lot to accomplish when you’re on a time crunch. To make your life less stressful we always recommend that pets be boarded over the first weekend. Wait! But I love my pet! I don’t want to put them in a boarding shelter. We get it. Pet boarding shelters can be sad and depressing. They can feel like pet prison, leaving you feeling like a subpar pet parent. The good thing is that there are plenty of better options! One of the best services we’ve had success with is Rover.com. Instead of sending your pets to a kennel, it helps you find local people who would love to board your pets in their home. It takes the guilt of sending away your cat or dog off your shoulders knowing that they’re being cared for by other pet lovers in a comfortable environment. This may cost you a little money but this will pay dividends when selling a house with pets in Maryland. By going above and beyond, you’re increasing the chances of a quick sale when selling a house with pets in Maryland. You want as large of a potential buyer pool as possible. By removing all signs of cats and dogs you’ll ensure that your home stays in the running for any potential buyer who walks through the home. “Some people will outright avoid houses with pets,” says Mariko Baerg, a veteran agent with with a team of Coquitlam Realtors. 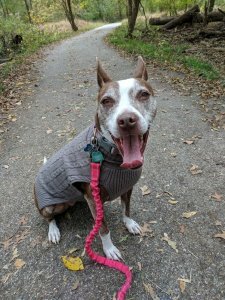 She recommends that sellers coordinate with local family members who may be able to supervise your pets over the weekend. “Once you’ve coordinated a pet caretaker, spending some time repairing any existing pet damage such as chewed door trim and scratched window sills.” Selling a house with pets in Maryland will likely mean extra repairs, but these are often simple and cosmetic. Pets can be tough on homes, but that doesn’t mean there aren’t actions you can take to make it look pristine for the first showing. Carpet and upholstery are some of the biggest offenders when it comes to pet odors. We recommend to everyone that their first step be to hire a professional carpet cleaning company to come out and steam clean your carpets and furniture. You’d be amazed with the difference a professional steam cleaner can make! Decluttering is key to a show ready home and pet accoutrement is no exception. Selling a house with pets in Maryland means that you need to get your hands dirty. Ideally a buyer shouldn’t have any idea that pets were ever in the home. Selling a house with pets in Maryland can be a lot of work, but keeping things clean and tidy can give your home a winning edge. Don’t Forget the Pooper Scooper! When we’re spending so much time on the house’s interior we often forget to pay attention to the outside. Nothing is worse for a buyer then walking up to your home excitedly, only to step in dog mess. Take some time and make sure that the yard has been checked from top to bottom for any “surprises” that you wouldn’t want buyers to step in. What If We Don’t Get an Offer the First Weekend? This is a valid concern when you’re selling a house with pets in Maryland. 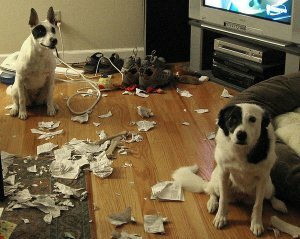 You went through all this effort just have bring pets back into the house to make a mess. Don’t worry, your efforts weren’t in vain. We find that homes are much easier to maintain once they’ve had a deep cleaning. To keep things manageable we recommend you restrict your pet to a particular section of the house. This could be the basement (if you have windows), a mudroom, or a recreational room. Ideally this will be a place that’s small and easy to clean. Vinyl flooring or tile is ideal. Don’t worry, working with AE Home Group means that your house will be priced appropriately, increasing your chances of receiving an offer quickly. If you have a house that you’re looking to sell, give us a call at (443) 826-9024 . We love working with other pet lovers and can’t wait to help you move onto your next family home!